Careful monitoring by Ranger Rene Cartagena in Bolivia’s Barba Azul Nature Reserve is increasing the likelihood of Blue-throated Macaws breeding in the reserve. Rene is employed by Asociación Armonía, the Bolivian conservation partner of World Land Trust (WLT), as part of WLT’s Keepers of the Wild programme. In 2013 WLT part funded an extension to Barba Azul Nature Reserve. Blue-throated Macaws (Ara glaucogularis) are classed as Critically Endangered by IUCN, with a wild population estimated at just 350 birds. A congregation of more than 100 Blue-throated Macaws depend on the reserve for food and roosting sites during the non-breeding period, but no breeding pairs have yet been recorded in the reserve, which is named after them. In late 2014 Rene and his colleague Hernan Lopez placed 20 nest boxes on small forest islands located in the Rio Tiniji. These islands provide safety from predators that feed on Blue-throated Macaw eggs and chicks. During the first five months of 2015, a French student, Nicolas Lefrique joined the Barba Azul team to help monitor the macaws. For his part, Rene inspected all the nest boxes to see if they were occupied, and repaired the nest boxes where necessary. No pairs were observed in any of the next boxes, and Rene will keep monitoring them with the hope of seeing Macaws breeding in 2016. Despite the lack of macaws in the boxes, two other bird species used them. One was a Barn Owl (Tyto alba), the first recorded breeding pair in the reserve with at least two eggs. Several Black-bellied Whistling Duck (Dendrocygna autumnalis) also used the nest boxes, with total egg numbers as high as 65. In areas of Beni savanna outside the reserve Blue-throated Macaws have been using similar nest-boxes, so it is expected that the macaws will start using these artificial nests in the near future. Meanwhile the rangers continue to experiment with different materials, entrance size, shape and location of positioning, to create the optimal nest site for the Blue-throated Macaw. The movement of Blue-throated Macaws is also monitored. Before 15 May numbers were between two and 10 individuals observed per day. After 15 May larger groups arrived to forage in the reserve in flocks of up to 62 individuals. The breeding season ends approximately in May and can therefore be the explaining factor of the influx of Blue-throated Macaws in the reserve. 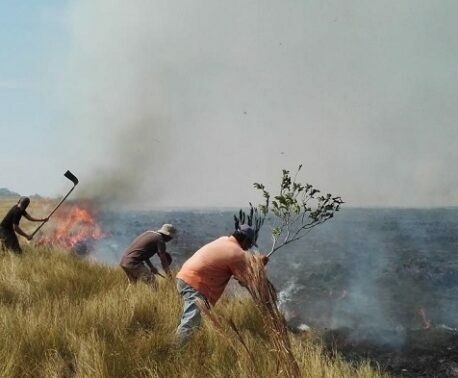 Rene is also assisting with Barba Azul’s programme to protect the Motacu palm on small forest islands. 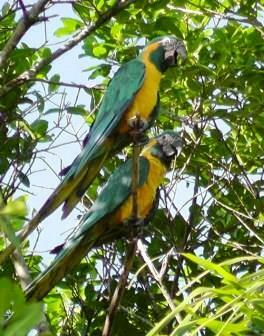 The palm fruits are the main diet for the Blue-throated Macaw and deforestation and extensive cattle ranching has resulted in the disappearance of palms from many of the Beni savanna forest islands. Rene’s other main activity is checking trail cameras and relocating them as necessary. 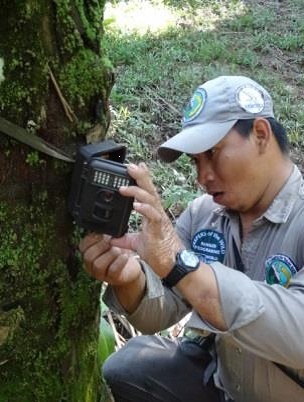 Since May, trail cameras have recorded 11 mammal species: Brown Agouti (Dasyprocta variegata), Lowland Paca (Cuniculus paca), Collared Peccary (Pecari tajacu), Ocelot (Leopardus pardalis), Nine-banded Armadillo (Dasypus novemcinctus), Crab-eating Fox (Cerdocyon thous), Crab-eating Raccoon (Procyon cancrivorus), Grey-brocket Deer (Mazama gouazoubira), Tamandua (Tamandua tetradactyla), Capybara (Hydrochoerus hydrochaeris) and Brown Howler Monkey (Alouatta guariba); and two bird species: Greater Rhea (Rhea americana) and Black Vulture (Coragyps atratus). In July 2015 WLT launched Keepers of the Wild 2020, an appeal to raise £750,000 to guarantee WLT’s ranger support programme until 2020. You can help fund Rene’s work in Bolivia by donating to Keepers of the Wild 2020.